After a first alert on the night of 4-5 April, we went through 4 difficult nights from April 11 till April 15. The night of saturday/sunday was particularly cold with negative temperatures very early on the night on big areas. We have used the protection by spraying on the 4 nights and it was efficient. On other areas we have used candles (big ones!) only during the last 2 nights. We can see some damaged buds but, at the moment, the visible damages are not too important in Chablis as in Rully. The moment of truth will arrive with the flowering: at this moment you can see if the flowers are turning into grapes as expected or not (meaning if they have been damaged by the frost or not). For the 10 next days, the predicted temperatures are mild but we have to wait until mid May to be totally frost-safe. During this week, thanks to the very good weather we have made a horsetail spraying; it is a prevention against mildiew. After a perturbed beginning of the season till mid-June, the nice weather finally came back, hot and dry, during the whole summer. It was very positive as we had no problems with mildiew and oïdium (unlike the south of France much more wet this year). But, the risk on a very dry year is to have a very low juice yield such as 2017 or 2003. Finally this 2018 harvest has been fantastic in every way. An outstanding quality with relatively soft wines but with good acidities on our parcels. A perfect sanitary state so a minimal sorting. And an unexpected quantity, with good yields but that remain reasonnable on our perspective to reach a good quality. 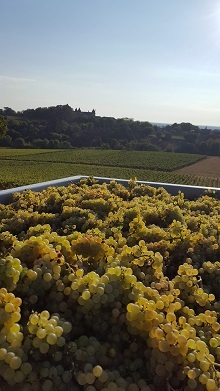 We have begun the harvest on Sept 3rd in Rully and Sept 5th in Chablis for respective durations of 6 and 10 days. On Sept 15th everything was in. The alcoholic fermentations started very quickly and were rather turbulent probably because of a great yeast population on the skins (no rain) and the summer temperatures. The fermentations are almost all achieved now and the vinification is going on. This year, the weather is more or less clement even if we have had big thundery periods. Some hail has touched a part of our vines with damages estimated around 10% for the moment. The strong heat has also caused here and there burst damages on the grapes exposed to the evening sun. The season is also very early compared to the average so the harvests could begin at the end of August, beginning of September. The season has started a bit late but then, thanks to the very nice weather, the vine has grown very regularly. Now we are even a bit early if we compare to the average. We are beginning to tye up on the earliest places (the cote de lechet with its stony soil here above). During the last 3 days, the weather has not been so great so the growth slows down. The hard period of spring frost is now behind us so... until now, everything is fine! But, as would say an experimented vinegrower, "never sell the bottles before you have the grapes inside the cellar"... To be continued! On the earliest parcels, the first leaves are appearing. On later areas, we are at the stage of bud burst. So this year is on the average, even a bit late. But with the temperatures announced for next week, it should catch up. We have brought compost; with the next ploughing, it will be completely mixed to the soil. At the moment, we are making the last phase of the pruning. We have pruned in 2 steps in order to delay a bit the bud burst. Then we will attach the stick to the trellis. Here also, we are not going too quickly as a tied vine can be more damaged by the frost. 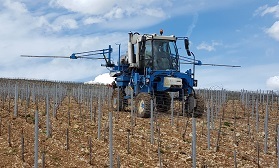 It is also the right moment to spray the 500P to stimulate the soils' life. "Dynamised" in warm water (left picture), then it is sprayed with a tractor which is specifically dedicated to biodynamie (center and right pictures). Right now, the challenge, for this spray as well as for ploughing, is to find the right moment because of the frequent rainfalls.